Yukon is located on the west side of Oklahoma City, and has a great community feel and school district. Click the button on the right to see all homes for sale in Yukon. Yukon is a western suburb of Oklahoma City, and it is located in the central portion of the east side of Canadian County, Oklahoma. 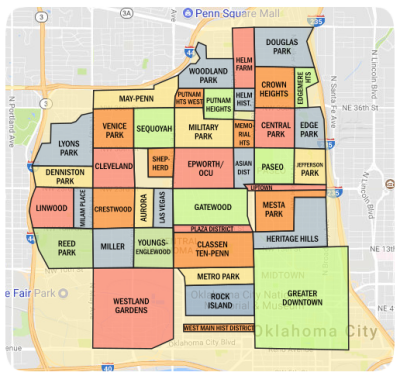 It is a part of the Oklahoma City Metropolitan Area along with Oklahoma City, Mustang, Piedmont and Edmond. 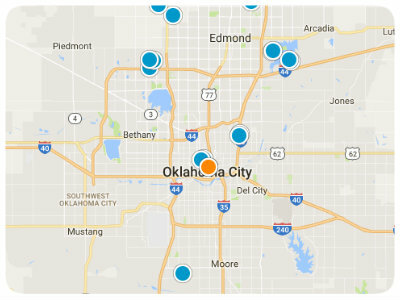 As of December 2013 it has a total population of 36,483 and is now considered as bedroom community for people who work in Oklahoma City. The Flour Mill on Route 66 is one of the best known landmarks here at Yukon which was revived in 2013 and programs to improve the mill continues to be pursued. With Yukon’s safe neighborhoods, low crime rate, top rated schools, top of the line health and medical services couple with their strong core values, this lovely city of Yukon is definitely family oriented. This town maybe small but they strive to be the best in what they do. Yukon offers a lot of fun things that everyone will surely enjoy. Some of the best places to eat here at Yukon are: Primo’s d’Italia, Interurban Restaurant, Green Chile Kitchen, Big Easy and Braum’s. Other local attractions here are Yukon’s Best Railroad Museum (3rd & main), features historical train cars while the Yukon Farm Museum (3rd and Cedar) has historic tractors and equipment. Don’t miss out Yukon Historical Society Museum and Art Center (601 Oak Street) that features a replica of businesses on Main Street and a complete history of the town as well as the Stage Door Theatre performance group. On a Saturday night come out to Czech Hall, dance, enjoy and have fun. It has the largest dance hall in Oklahoma and is just located just south of 1-40 on Czech Hall road. There’s also an annual Oklahoma Czech Festival the first Saturday of each October in which Czech Hall pays tribute to early Yukon settlers. Another one is this lovely and amazing farm that hosts different event is this 33-acre Kirkpatrick Family Farm that was opened in 1900’s. There are a wide variety of city parks in Yukon that will fire up and stimulate your spirit. They have 3 recreation facilities, 3 aquatic facilities, 12 parks with over 25 annual special events but the best is probably Chisholm Trail Park. It is the site for annual events like Yukon’s Concert in the park series, where everyone can come for free, enjoy live music concerts from country to jazz every Thursday evenings during the summer months. It is also a site in celebrating Yukon’s birthday known as the Freedom Fest July 4th. Again, this is event is free for everyone to enjoy 2 night of beautiful and marvelous fireworks display, concerts, activities for kids, hotdog eating contest and a whole lot more! And last but definitely not the least is this great quality and blood pumping Yukon BMX Raceway thoughtfully developed by parents, riders and sponsors. It is just located at Lewis Carroll Taylor Park on 11th Street. Here viewers and first time riders can watch any race and try out the track for free. Even experienced riders can learn more about racing. This marvelous city of Yukon is also a leading school in Oklahoma where "Excellence in Education" is their foundational cornerstone and they take seriously the role they play in shaping the fabric of its community, the students. Some of the most reputable schools here at Yukon, in no particular order, are: Central Elementary School, Shedeck Elementary School, Independence Elementary, Lakeview Elementary, Yukon Middle School, Yukon Highschool and Yukon Alternative Learning Education. Overall, Yukon has a lot to offer and everyone will surely enjoy the quality of life here in this magnificent city of Yukon.